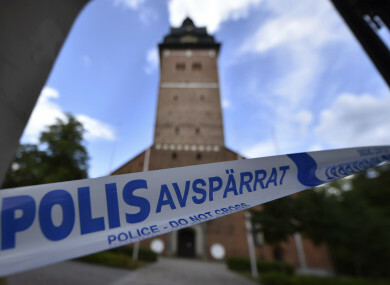 THIEVES WHO ROBBED two 17th century royal crowns and an orb from a Swedish cathedral remain at large, a day after their daring midday heist by motorboat. The theft occurred just before noon yesterday, when gold burial crowns belonging to King Karl IX and his wife Queen Christina were stolen from a display in a locked cabinet in Strangnas Cathedral, around 100km west of Stockholm. The jewels were originally interred with the couple but were later exhumed for public display. King Karl IX’s crown is made of gold and features crystals and pearls, while Christina’s is smaller and made of gold, precious stones and pearls. Police quickly had helicopters, patrols, and search dogs looking for the thieves, but efforts to find the culprits have proved fruitless so far. An international hunt for the jewels has now been launched by Interpol, while none of the thieves have been identified. Swedish police spokesman Stefan Dangardt said the objects would likely be “very difficult to sell”. “We have as yet no value of the stolen goods, except that it is a national treasure,” Dangardt told AFP. “Several people were seen leaving the church by boat or waterscooter after the theft. “We have spoken to witnesses, but we are interested in further information from anyone that has made any observations,” he said. One man who was having lunch outside the cathedral at the time of the heist told a local source that he saw two men dash from the building toward a motorboat waiting on Lake Malaren. “I saw a white little boat with an outboard motor on the back. The two men hurriedly jumped on board and it sped off,” he said. “I knew immediately they were burglars, because of the way they were behaving,” he added. National police coordinator for thefts of cultural artefacts, Maria Ellior, told news agency TT there would be “a lot of media interest” in the objects. In 2013, King Johan III’s burial regalia was stolen from Vasteras Cathedral. It was recovered several days later in a garbage bag left on a country road, following an anonymous tip off. “One can hope that something like that will happen in this case,” Ellior said. The perpetrators of Tuesday’s heist face up to six years in prison for aggravated theft if caught. Email “International manhunt launched after thieves use motorboat to steal Swedish national treasures”. Feedback on “International manhunt launched after thieves use motorboat to steal Swedish national treasures”.